Anyone who’s tried to create a multi­media-based ebook can tell you that it’s not easy. While many popular applications offer export capabilities—which more or less corral text and images into an ePub document—proceeding from there is a challenge. Often, creators encounter troublesome CSS fragments, mismatched formats, and limited creative options within the apps. Apple’s new desktop app, iBook Author (Mac App Store link), is designed to build beautifully crafted multimedia books solely for the company’s iBookstore and iPad tablet. Conceived as a tool for creating Multi-Touch textbooks featuring visually stimulating elements such as photo galleries, video, interactive diagrams, and 3D objects, iBooks Author can be used to construct an ebook in any genre. There’s no support for the iPhone, the iPod touch, or any other ebook platform. The reason is basically structural. iBooks Author employs a new format called ibooks (.iba), an amalgamation of the W3C’s ePub standard and CSS, with some Apple-specific code mixed in. These books are far more complex than a typical ePub volume, making them incompatible with any other reader. You can also use iBooks Author to output your text in PDF or plain text, but these capabilities are designed as proofreading mechanisms rather than alternate formats. The controversial iBooks Author end-user license agreement (EULA) specifies that if you want to sell books created with the app, you must do so exclusively through Apple’s iBookstore—though you can give away your books if you choose. While these rules vastly constrain the potential outlets for Apple’s new program, authors who want to build iPad-exclusive books will find an impressive tool in iBooks Author. 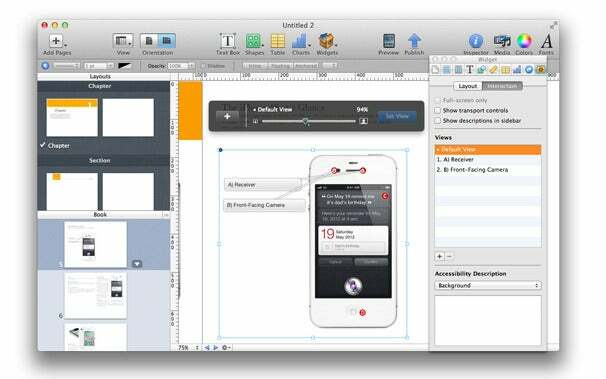 Like its spiritual cousin, iWeb, iBooks Author is template driven. Six templates—Basic, Contemporary, Modern Type, Classic, Editorial, and Craft—are visible on launch, and each can be modified and saved as a new template. By default, books are divided into chapters and sections, just like a typical textbook. On the iPad, each chapter renders as a separate miniature TOC, with pages displayed as scrollable thumbnails along the bottom of the screen. This works well if there are multiple sections within each chapter. If a book has only self-contained chapters, you can build a single splash screen to create a section for each chapter. Aside from arranging the book’s content, you can also alter its cover, include an optional introductory video, or add terms to a searchable glossary. The glossary is pretty neat and incredibly useful for creating a how-to manual or textbook: Glossary terms can include text, shapes, images, tables, and charts, and you can also link related terms within an entry. While there’s a decent amount of flexibility within the templates, I ran into a few layout problems. Certain inserts, such as sections or chapter titles, are uniformly styled throughout a book, so if, for example, you change the font or size of one title instance, all of them change—which is annoying. 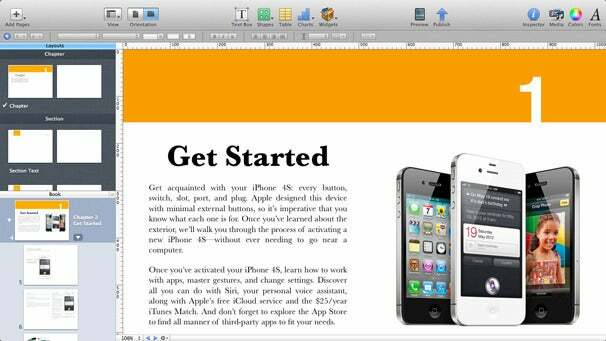 iBooks Author has a variety of widgets that users can insert to add interactive content to their projects. In addition, certain template text, like the section breakdown for a chapter’s TOC, can’t be edited except in face and size. You can’t change the way the list is written (for instance, 3.1 Section Name) and you can’t delete the mini-TOC—but you can send it to the background. Despite such quirks, iBooks Author offers an impressive range of tools for tweaking and manipulating templates, many of them taken from its sister program, Pages. You can break pages and columns, style text, add drop shadows to shapes, mask images, change background colors, and lots more. I was able to very quickly mock up a chapter of one of Macworld’s superguides, using our PDF as guidance, and almost every design feature carried over accurately. I was also able to import text and images from our Superguide chapter using the app’s Insert Chapter From Pages Or Word Document feature. In addition, iBooks Author offers tools to help build your book for viewing in either portrait or landscape mode, though you can choose to constrain your text to just landscape. Previewing is also easy if you have an iPad: Tether it to your computer via USB and click Publish, and iBooks Author sends a proof of the book to iBooks 2. I was disappointed that I couldn’t do this wirelessly—with AirPlay, it shouldn’t be difficult to implement such a feature. While iBooks could stand on the merit of their fixed-format layout and content alone, Apple didn’t stop there: In addition to the chart and table options carried over from iWork, the company has added six interactive widgets that let you include special content in your ebook: Gallery for images, Media for movies, Review for interactive multiple-choice quizzes, Keynote for importing Keynote presentation animations, an interactive zoomable image with callouts, a 3D model, and a custom HTML snippet. You can build some widget content in iBooks Author, along with an image or clip. For Keynote, 3D, or HTML options, however, you need an outside program. You build Keynote snippets in—what else?—Keynote; you make and export 3D models using a compatible 3D program; and you can create an HTML snippet with Dashcode. Tumult's Hype animation design program is another option. Unfortunately, even with help documents, Apple doesn’t make this process particularly clear: You can more or less figure out the in-app widgets, but when it comes to those that require imported files—especially Dashcode HTML—you’re left to fend for yourself. The iBooks Author interface largely resembles that of the other iWork apps—unsurprising, considering that the iWork team helped create it. Another problem with interactive content is file size. The textbooks available on the iBookstore currently range in size from 960MB to a whopping 2.77GB, and your own iBooks can quickly spiral out of control in terms of size. Apple won’t accept books larger than 2GB on the iBookstore. Unlike Pages, there’s currently no option to reduce file size or compress images—iBooks Author attempts to do this automatically, and often not very successfully. Once you’re finished producing your book, you can either export it (as an ebook, PDF, or plain text) or prepare it for sale in the iBookstore. You can only open the ebook in iBooks 2 on an iPad; don’t try to open it on an iPhone. If you plan to sell your book (or distribute it for free) on Apple’s iBookstore, iBooks Author has a Publish tool to prepare and package your content for sale. Clicking the Publish button wraps your book in an iTunes Producer package where you can then edit it and prep it for publication within iTunes Producer. These processes are straightforward, but I dislike getting booted into Producer for publication. If you plan to create a book solely for the iBookstore, and you’re not concerned about other ebook platforms, iBooks Author stands above any other option, despite its quirks and hurdles. Those who rely on multiple platforms—or who object to Apple’s EULA—may be wise to find a different and better alternative, or to stay away until updates make the program better suit their needs.